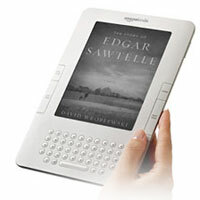 Amazon recently rolled out a new program called Kindle Publishing for Blogs. The beta program offers Kindle owners subscriptions to blogs. Blogger receive 30% of anywhere from $0.99 to $1.99 per reader per month; so for every thousand readers, a blogger could get $999 to $1,999. (It’s not clear how Amazon determines the price it charges for a particular blog subscription.) The setup process takes about 12 to 48 hours before a blog appears in the Kindle Store.
. . . blogs derive much of their power from their nowness–their real-time relevance is what’s presenting a challenge to traditional media reporting. By offering them to Kindle readers as so much dead text…is this Amazon’s subtle way of propping up the ailing newspaper industry? Either that, or Amazon is thinking far into the future to a time when people will pay to read blog posts. Hard to imagine, but not outside the realm of possibility. Amazon sees blogs eventually supplanting newspapers (and in some cases magazines), at least in the US. As these blog based news organizations grow in influence and sophistication, they may begin offering premium content for subscribers. Amazon sees a tie between blogs and books. Blogs can function as the progenitor of books, and as an extension to a published book. Blogs by popular authors may command a small subscription price and help drive sales of books. Amazon thinks readers may be willing to pay for a different blog reading experience – something between a computer screen and a printed page. Amazon isn’t sure what to expect but thinks the experiment is worth a shot. One thing is sure; if the Kindle blog publishing program is successful, other purveyors of e-readers will soon follow with similar programs of their own. This entry was posted in blog to book, blogs & writers, Journalism & Newspapers, open publishing, publishing strategy, readership strategies and tagged Amazon, blogs, Kindle. Bookmark the permalink.